I’ve written about the West Swindon sculpture trail in several different ways in this blog. This though is a bit different. It’s a more literary piece being written as a piece of coursework for a #travelwriting module I took as part of my degree studies. Twice in year two of my BA literature studies I encountered a quest. In ‘A Handful of Dust’, Evelyn Waugh sends his chief protagonist off on an ill-fated quest to seek another Eldorado. In ‘Coming up for Air’, George Orwell packs George Bowles off on a nostalgic, and similarly ill-fated, quest back to his childhood. So it was that, in one of those curious ‘life-imitating-art’ symmetries, I found myself on a quest of my own. Well, two quests actually as it turned out. Quests it seems are like buses: you wait more than half a lifetime for one to come along and then two arrive at once. If only the same could be said of trains. A spur of the moment decision early in the summer of 2013, to set up a Swindon centred blog, began as a conscious quest to dispel the all-too-commonly held belief that the town is a dull, soulless urban landscape bereft of culture. Given the sometimes dispiriting skin of Swindon it’s not hard to see how this conclusion might be drawn. But peel back that skin and juicy segments of culture, leisure, parks and a varied industrial heritage nestle there waiting to be sampled. So it was that, tired of the constant dribble of negative opinion about the town I have made my home, and come to love, I decided to mount an offensive and redress the balance with a blog my weapon of choice. It is said, after all, that the pen is mightier than the sword. To give my personal homage to the town a starting point I conceived a non-definitive list of ’10 things to celebrate about Swindon’ – a shout-out about things that struck me as being positive attributes when I first pitched up here twenty years ago and which, for the most part, remain so now. High on this list was the public art. Perhaps surprisingly, given its any-town status, its enormous urban expansion and generally derogatory media portrayal, Swindon possesses a rich cultural landscape just one feature of which is its abundance of public art. Back in my corner of Derbyshire the nearest we got to public art was an old pump, a Cenotaph and a redundant pit-head winding wheel. Indeed I was entirely ignorant of the term public art until I began blogging about it. Hence I was quite fascinated by this ordinary town with its extraordinary punctuation of sculptures and statues. So having found the blog’s beginning, I inadvertently triggered a secondary, interrelated quest of exploring Swindon’s sculptures. And herein began a voyage of urban discovery. Not an epic journey on the scale of Columbus looking for his New World but nevertheless significant in the newness it revealed in my own world. Needing to start the aforementioned shout-out list somewhere I settled on Swindon’s sculptures – for the entirely pragmatic criterion that two of them are situated in close proximity to my home. Internet research on these art works proved interesting. These two sculptures turned out not to be random isolated pieces as I’d assumed. Rather they formed part of an entity, a five-mile circular sculpture trail installed when the extensive West Swindon suburbs were built. And I had absolutely no idea of its existence, despite having lived here for twenty years. It was clear now that, in the interests of blogging research, I was going to have to do this sculpture trail when the opportunity arose. In ‘The Quest becomes a Trek’, Pico Iyer writes that travelling should be done alone. Ignoring that advice I decided an impending visit from a University chum was a good opportunity to explore it – I needed someone useful with a map for a start. Hence, in the early summer of 2013, with exams done and the sun actually shining for more than two consecutive days, we made a plan to go exploring sculptures in uncharted territories of West Swindon. Here be dragons. First on the list for our enquiring minds and eyes was a statue in bronze of Diana Dors, a daughter of Swindon who grew up to be a famous film-star, a larger-than-life character, often given the epithet ‘Britain’s answer to Marilyn Monroe’: hence the fittingly larger-than-life homage in bronze outside my local cinema complex. Though I’d seen this one before, together we spent some time studying and discussing it. After some debate our conclusion was that whilst she was undoubtedly in a fitting location it was a pity the statue wasn’t especially flattering, being more caricature than portrait. Moreover it was a greater pity still that some wag had stuck chewing gum under one of her nostrils giving the effect of a giant bogey hanging there. The immaculately groomed, old-school glamour puss that Miss Dors embodied was never seen in such a sloppy state so it’s rather a shame that vandalism and neglect are letting her down now. Anyway, having duly debated and digested Swindon’s very own blonde bombshell, off we went in search of the next one on the trail, ‘How the Mighty Fall’. Installed in 1989 its creator invited observers to transport themselves into the future and view it as a 20th Century archeological artefact. An envisioning made reality with the turn of the century and an invitation the visitor to this shape-shifting sculpture is compelled to accept as it neither willingly nor easily relinquishes its meaning. Viewed from one angle you can see a crash-landed WWII aeroplane, a perception encouraged by the imprint it bears of arms and hands cupped around a mouth that appears to be screaming. But walk right round to the other side of it and it changes completely: now there’s a torso of man imprinted on the metal. Viewed from behind though it becomes something else entirely, conjuring an image of a slender, silver, slither of a carriage with red wheels either side of it, emanating a sense of something alien, a sense of alterity. Not only is Swindon in possession of a rich, albeit often well-hidden, cultural landscape, it additionally benefits from a vast number of green spaces, somewhere in the region of two hundred I believe. It’s astonishing. Some of these are formal parks and gardens, some of them – as in the case of Lydiard Park – were once the estates of minor aristocracy. But others are simply large areas of open space. It’s striking that just five minutes walk from the statue of Diana Dors, en route to the next sculpture, you find yourself in one of them, whereupon you can immediately forget that you are actually in the middle of a sizeable conurbation. It was in this particular green space, as my companion and I meandered along this barely-known sculpture trail, that we came upon an outdoor gym and a play-park, both of which were new to me. Herein we met the first distractions to our quest. Well, slides are there to be slid down after all. Eventually tiring of the dubious pleasures of the outdoor gym and the play-park and having given ‘How the Mighty Fall’ all due consideration we followed the map to sculpture number three en route to which further discovery ensued. The walk took us through the Bramptons, a Stepford-like housing estate the existence of which I was utterly ignorant. It’s worrying. How can one live so long in a place and have so little idea about what is out there – particularly not a housing estate like this one with a swimming pool and a clubhouse not to mention impossibly neat hedgerows, shrubbery and squeaky-clean pavement and paths. And of course no graffiti. One imagines those walls would repel any such endeavour. It really was most discomforting. Number four on the trail, a huge blue and white concrete horse with rider, billed as a homage to the numerous white horses carved into the hillsides of Wiltshire we found to be in a sorry state of repair, it being covered in graffiti and overhung with branches from the surrounding trees. Quite forlorn he was. The walk from him to sculpture number five took us through bits of the old/real Swindon tucked away amidst the 1970s and 1980s developments, jewels of a past time waiting to be chanced upon. We passed an old farmhouse, once part of the Lydiard estate, but now a city farm thing with chickens roaming about and ancient caravans in the yard. It’s the sort of place that knits things with yoghurt. Many people love it. Close by there’s a converted barn with a lovely stained glass window in its side. I later discovered this too had been a farm on the Lydiard estate. Echoing Pico Iyer’s sentiment on traveling being best done alone, Jonathan Raban has observed that lone travelling puts you more in the way of the chance encounter – and there may well be something to be said for that. Nevertheless we had no lack of them as we sauntered along. Whilst traversing yet another stretch of green space we fell into conversation with a chap out walking his dog. In the course of this exchange we discovered he and my companion shared an interest in ukulele playing and that POWs had been billeted at Lydiard Park in WWII – a facet of Swindon’s rich history of which I had hitherto been ignorant. In one of those odd coincidences that punctuate our lives, what should pop onto my Facebook timeline the very next day but a photograph of those self-same POW barracks? My bus ride home from the town centre takes me past the garden of a house that has always puzzled me, having as it does a giant stone cat in the front garden. Why, I’ve asked myself for the last twenty years, would someone do that? Well, as it turns out, they didn’t. What I’ve spent two decades thinking was a rather grandiose albeit grubby garden ornament installed by a cat-obsessive turns out to be number five on the sculpture trail. Entitled ‘Hey Diddle Diddle,’ it’s actually a representation of the children’s nursery rhyme. Stomp all over the lawn on which it sits, as we did, and you see that each side of it represents a different facet of the rhyme. The front end of this sizeable plinthed sculpture, glimpsed all these years from the number 1A bus, is the cat of the rhyme – hence my erroneous assumption. But go round the back of it and you will find the cat’s bovine companion whilst each side respectively features the rhyme’s little dog laughing and the dish running away with the spoon. It’s a delightful piece of work, intentionally and appropriately placed in this suburban domestic setting. Though sadly and direly in need of a wash and brush up. This being a pleasant summer stroll in shorts and sandals rather than an arduous trek involving sleds and snow-shoes we didn’t require the fortitude and strength of character of Scott and Oates crossing a frozen continent to plant a flag for Queen and country. Not with several pubs and shops along the way. Nevertheless much that we’d encountered thus far as we sallied forth around West Swindon had been a defamilarizing experience that provided literal and metaphorical revelations. Some things were revealed to me for the first time whilst many familiar things were seen with new eyes. In approaching and reaching the last sculpture that my companion and I visited as by now we’d been out for four hours and dinner and red wine were beckoning – there was one final eureka moment and somewhat thought-provoking chance encounter. Walking to this final one on our walk, though not the last of the trail, and reading the information on it, still it didn’t register with me, still I didn’t make the connection with the words on the page and what was shortly to be in front of me. Only then did I realize. This particular sculpture is five minute’s walk from my home. Situated alongside my GPs surgery and the local Tesco Express I walk past it several times a week. And all those times, in all those years, I’d seen but never, until that moment, properly noticed or considered this sculpture comprised of big blocks of carved stone and railway sleepers. And I felt quite chastened that I’d given this artefact so little thought. As it often has children climbing all over it I think perhaps I’d simply viewed it as an elaborate, low-level climbing frame. But now, in possession of its name, it suddenly made sense. 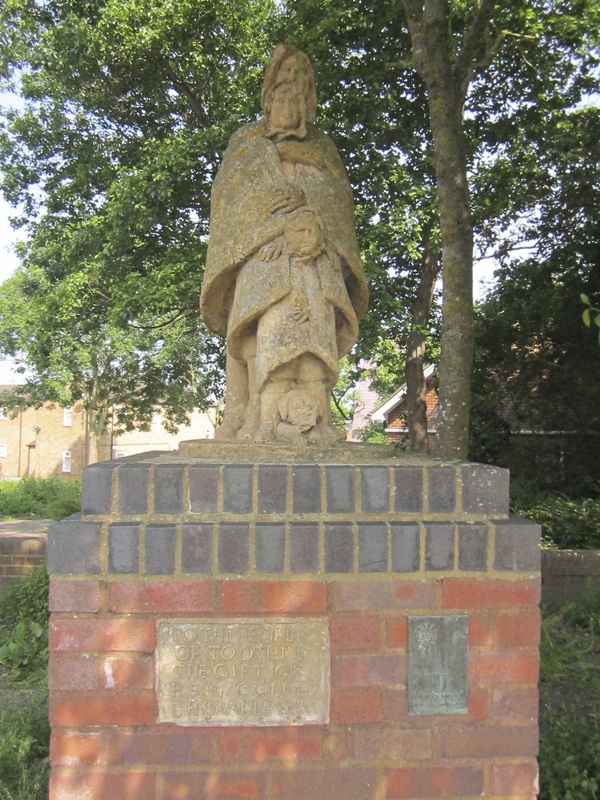 Entitled ‘Nexus’, meaning link or connection, made of railway sleepers and situated at a point where one village centre connects with three others this previously ignored sculpture took on a new mantle of significance. In spite of this I wouldn’t say I had that same un-definable emotional response to it as I did to some of the others of this set but at least now I understood something about it. As we were photographing it a gentleman out taking the summer evening air with his young son approached us. He strolled across and commented that he’d no idea he lived in a heritage site. Which brought me up short rather and caused me to take stock. Because really, at twenty-five to thirty years old, heritage is exactly what these unloved and unexplained sculptures are. As with my guide-book entry for the Magic Roundabout, (uni coursework) this is an attempt at the same for the West Swindon Sculpture tour, something I’ve written about from a personal viewpoint. However this piece is an attempt to write about the sculpture trail from the viewpoint of a dispassionate observer writing about this entity as if for a guide book. And why not? Is that such a fanciful idea? If one thinks of Swindon at all, most likely to come to mind are the Designer Outlet village, the STEAM museum and, perhaps, Lydiard House and Park. Somewhat surprisingly though this sometimes un-prepossessing town possesses a rich cultural landscape liberally scattered with public art – in particular in the West Swindon development. This extensive and surprisingly green suburban area links the town with the M4 and comprises several distinct ‘villages’, several of which feature a ‘village centre’. Intriguingly punctuating this conurbation is a fascinatingly diverse collection of sculptures that comprise the West Swindon Sculpture trail. Installed between 1982 and 1992 these sculptures are unexplained and mostly unnoticed by the locals. They are also rather neglected but no less interesting for that encompassing as they do a gamut of subject matter ranging from realism to abstract with a film star and a nursery rhyme in the mix. Just a picture gallery of the West Swindon sculpture tour. But don’t rely on these – go and visit them for yourself! Here is a link to a map of the trail. 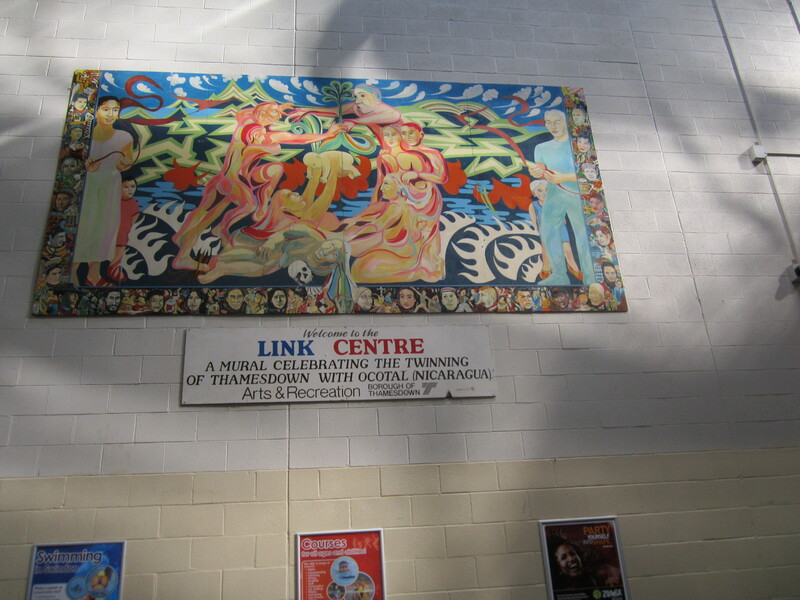 A good starting point for this tour is the Link Centre. The upside down Cassandra is no longer there but you can still see the mural commemorating Swindon’s twinning with Nicauraga. On from the Link Centre, the next port of call is Shaw Ridge Leisure park where you will find the larger-than life statue of Diana Dors, the homage to the larger-than-life actress born in Swindon. Situated, appropriately enough, outside the cinema. Now, not many minutes walk from the cinema, up onto the green open spaces of Shaw Ridge, you will come to ‘How the Mighty Fall’ and close by it the outdoor gym equipment. Next up, the tour takes you to ‘Hey Diddle Diddle’ – a fabulous representation of the nursery rhyme, prominently situated in a front garden in The Prinnells. Side view showing the dish & the spoon. A bit more trekking and you get to ‘Nexus’ at Freshbrook Village centre. Another village centre, another sculpture. This time ‘The Watchers’ at Toothill. Then, last but by no means least, before returning to the start point at the Link Centre, you will see Looking to the Future. The West Swindon Sculpture Tour | VisitWiltshire. At the end of part five of this series, Kim and I had reached Nexus at Freshbrook, at which point we called it a day as we were ready for dinner. We’d been out for hours and had a great time but had still only visited five out of the seven sculptures itemised on the tour. Next up on the list after ‘Nexus’ is ‘The Watchers’ at Toothill: ‘Artist: Carleton Attwood. Material: Cement Fondue. Project details: Funded by R.S. McColl and E.H.Bradley Building Projects Ltd. The sculpture represents guardian figures looking over the community.’ And, as you can see in the picture, they are still there, still quietly watching. Leaving Toothill, the tour takes you to ‘Looking to the Future’ near Ashingotn House and the West Swindon Centre. I’ve written about that one elsewhere in this blog so will leave that one behind and move on. The document and map my friend and I used actually starts and ends at the Link Cente and has this to say: ‘…. you may care to look up at the murals. And what can you find out about Cassandra – an eighth sculpture – standing on her head above The Mall? Now I’m assuming this means the actual sports centre rather than the West Swindon centre itself. I went in there and saw a mural – see picture – but have no idea if it’s the one to which the tour guide refers. Moreover, I’m not the most observant of people but I haven’t seen any Cassandra. For info, in Greek mythology Cassandra is the daughter of King Priam and Queen Hecuba of Troy whose beauty caused Apollo to grant her the gift of prophecy. So what happened to Cassandra I wonder? Perhaps she got fed up of being up-side down. I think I might. Anyway dear readers, that concludes the West Swindon sculpture tour/walk. It’s a wonderfully diverse collection of public art encompassing film stars, nursery rhymes and 21st century archeological artefacts. As I mentioned in the first post, the tour blurb says this 5 mile walk can be done in two hours. And I’m sure it can. But this is a walk that you can make as much or as little of as you want. It’s a good activity with a family as there are play parks along the way – these are partly responsible for Kim and I taking so long about it. That and the outdoor gym behind Shaw Ridge – see ‘How the Mighty Fall’. Shaw Village Centre is approximately half-way so lunch at the Village Inn could be incorporated – or a pint at the very least! For the cyclists out there, incorporate it into a bike ride – I haven’t looked at this in detail but I daresay the Sustrans cycle routes in the town would cover some or even all of this tour. Ditto with the Ramblers mapped walks. Swindon has some amazing walking and cycle paths – it’s on Sustrans Route 45 which goes from Salisbury right up to Chester – and these and other sculptures around the town must surely add another dimension? These, and all the public art we have here in Swindon, are a wonderful thing – just amazing – and I can’t help but feel that they are under-valued, under-promoted and un-loved. Is this sculpture tour not a tourism resource being badly and sadly wasted? It’s got parks, play areas, big open spaces, pubs and even hotels along its route. The ONLY information I could find about these sculptures as an entity was the plain pdf document which was probably put on the internet when it was invented. Why aren’t there postcards, leaflets with a map inside and some info about each sculpture and other things nearby? SBC what are you playing at? Think of Swindon and tourism and what comes to mind? STEAM, the Outlet Village and Lydiard Park. Oh and maybe the Oasis. And that’s probably about it. But there’s all this and so few people know about it. Shame on you! Someone put a comment on the post about ‘White Horse Pacified’ saying she’d been wanting to see that sculpture but had no idea where to look for it, but now – thanks to my blog post – she does. I rest my case. I’ve just today, found out about these interesting articles – see below – relating to the West Swindon sculpture walk with some really great pictures and other bits I didn’t know about, which is all really cool. When I started doing a web search to look for info for this blog regarding Swindon’s public art I couldn’t find these – just the old PDF file that I’ve been referring to. Never mind – I know about them now which is all that matters. It’s just great to know that there is stuff out there about it all. Here’s a link to a picture on the Swindon Local collection Flickr site. It’s of the poster designed by Ken White for the statue’s unveiling event.